The Telerik Dashboard sample app shows you how to use Telerik UI for Universal Windows Platform Charts and Gauges in a real use-case scenario to bring data to end-users in an appealing and meaningful way. The application visualizes statistic data about various economic factors in a number of countries and allows comparison between these countries' values. Included are various Telerik controls, serving two main purposes - visualizing data and filtering the parameters for the displayed statistics. CartesianChart(LineSeries) visualizing GDP per capita statistics for each chosen country. CartesianChart(AreaSeries) visualizing GPD per capita statistics for one country. CartesianChart(BarSeries) displaying the value added to GDP by services, manufacturing and agriculture. PieChart(PieSeries) displaying the value added to GDP by services, manufacturing and agriculture for one country. Radial Gauge showing the total tax rate in the chosen countries. BulletGraph used to display the "ease of doing business" index of each chosen country/ies. You can find the Telerik Dashboard source code on couple places. In the Telerik UI for Universal Windows Platform installation folder. You can open the installation folder. The dashboard example is located in the following folder ~\Progress\Telerik UI for UWP RX 201X\SampleApps\SalesDashboard.UWP. Under the download page of your Telerik account. You can log into your telerik.com account and open the download page of the UI for UWP suite. There you can download the archive file with the source code of the suite. When you decompress the archive file you will find a folder with the source code. 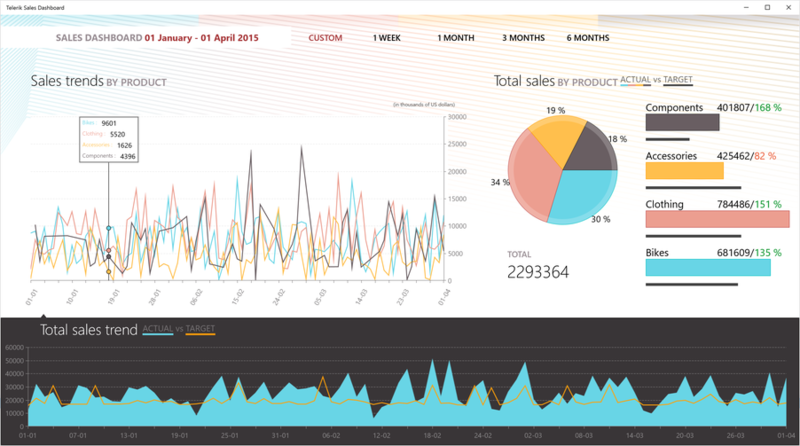 The dashboard example is located in the following folder ~\source code folder\SampleApps\SalesDashboard.UWP.